Rhubarb is a magically versatile vegetables (yes, it's a vegetable). It can be used in a variety of dishes both sweet and savory, and some even claim to like it all on its own (liars). But really, everyone knows that rhubarb is truly at its best when used as an ingredient in sweet desserts. 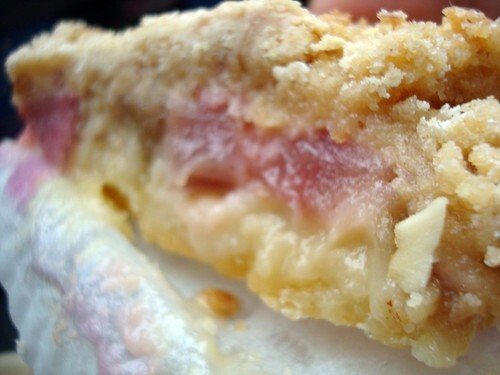 And recently we discovered a really, really good one: the rhubarb-strawberry bar made by Parisian Star Desserts. Parisian Star is a Seattle-based wholesale dessert company whose desserts live up to their name: fancy, Frenchy desserts that seem ideal for post-dinner party. They are sold at various venues around town, but they have an especially nice showing at PCC's Fremont bakery case, which is where the bar in question caught Mr. CakeSpy's eye. Now, there are plenty of awesome rhubarb crumb cakes, bars and pies out there. And with its cookielike base and crumb topping, this one didn't look too different from other varieties we'd tried. But this one has a little something special--it sets itself apart with a thick layer of custard, which perfectly mellows out the tart fruit in addition to adding a delightfully rich flavor dimension and density to the bar. As an added bonus, the custardy filling provided a perfect texture contrast to the slightly crunchy topping and firm bottom layer. But watch out--though it may look like a bar cookie, all the awesome in the middle does have a tendency to ooze, so this one definitely requires a fork and knife. Parisian Star Desserts Rhubarb Strawberry Bar, available at PCC in Fremont; for more information on their desserts and other places to buy, visit parisianstardesserts.com.